I was glad to find another local chapter of Sisters in Crime, the Border Crimes chapter with Kansas City-area members from both Kansas and Missouri. I’d attended the Partners in Crime chapter meetings years ago (before Life interrupted), but when I last checked, the group’s blog’s last entry was about a year and a half ago. Now that I’m getting out from under the Life interruption, I’d like to get back on track. One of the exciting aspects of the group meetings is that they’re held in the I Love A Mystery bookstore in Mission, Kansas. As a mystery reader from the days of Freddy the Detective, Nancy Drew and Beverly Gray (even perhaps Rupert, as each of his stories has a puzzling plot for the little bear to untangle), it’s a thrill to find a bookstore dedicated to my favorite genre. 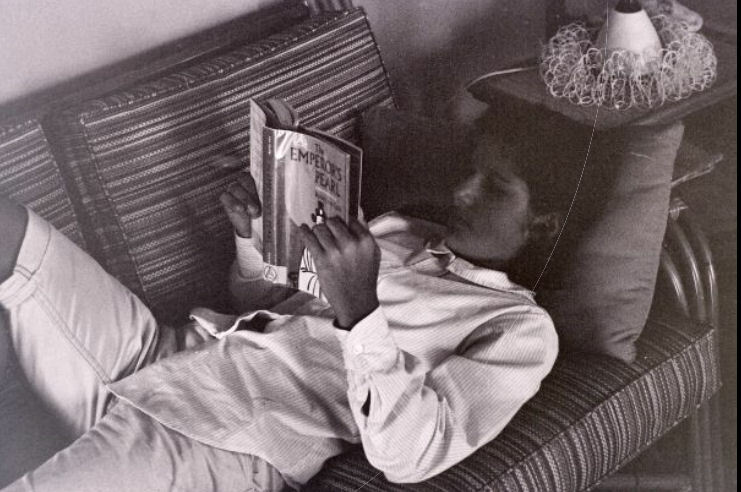 Me, in 1964, reading a Judge Dee mystery: The Emperor’s Pearl.